eCommerce shipping has become an integral part of businesses large and small and competing in this environment means offering incentives such as free returns to ensure customer loyalty. According to the 2018 State of Shipping report from Shippo, businesses are having to do more in order to keep up with the juggernaut that is Amazon in eCommerce. But the report reveals over 75% of retailers have identified shipping costs as their biggest challenge, which is a 7% increase from the previous year. With small businesses making up the vast majority of the retailers which find shipping challenging, there is a great opportunity for shippers to address this market. This is one of the talking points Shippo reports in the third annual survey. In the report, Shippo says eCommerce sales globally will increase from the $2.3 trillion in 2017 to $4.8 trillion in 2021. This growth will require more businesses to improve their shipping because customer expectations are only going to increase as this increasingly becomes the way consumers buy products. The report measured the efforts SMB online retailers are putting forth in terms of shipping, returns, and next-day delivery. Additionally, consumer expectations around shipping along with the presence of Amazon were eCommerceaddressed to determine if retailers are meeting, not meeting, or exceeding these expectations. Shippo carried out the survey from September to October 2018 with the participation of 300 small and medium-size only and retailers along with 500 consumer respondents via Google Surveys. Customer expectation in eCommerce is growing and free shipping has become the gold standard according to the report. In this year’s survey, 34% of shoppers said they will only buy something from an online retailer if they offer free shipping. This is more than a third of consumers, which has led more retailers to start offering the service. Coincidentally enough the same percentage of retailers (34%) now have a free shipping option, with another 35% stating they offer it as part of a promotion. 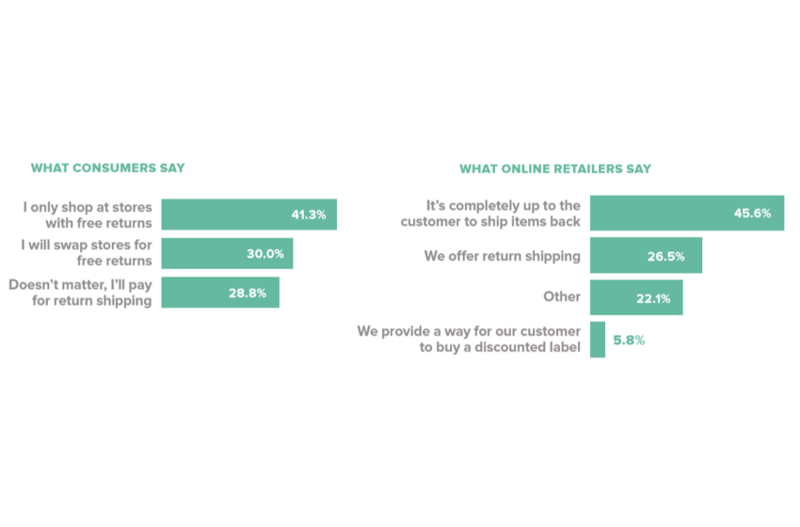 However, there remains another 27% of online retailers who don’t offer any type of free shipping to their customers. When it comes to free returns consumers also have higher expectations as they want a fast, free, and easy process. And they are electing to shop elsewhere if a retailer doesn’t offer Free returns. In this case, 41% of shoppers said they will only shop in stores with free returns, with another 30% saying they will leave the site they are browsing if it doesn’t offer free returns. 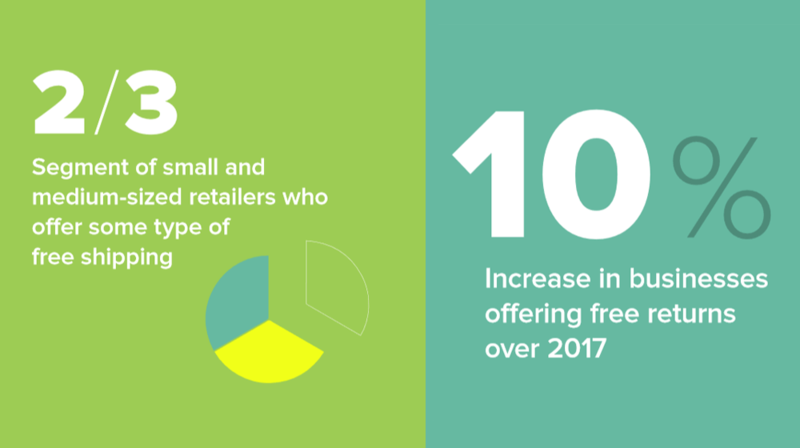 This has resulted in more retailers offering return shipping for free for all of their purchases, going up by 10% from the 17% of 2017 to 27% this year. At the same time, the number of retailers who make customers cover the return shipping has dropped by 11% from 56% to 45%. 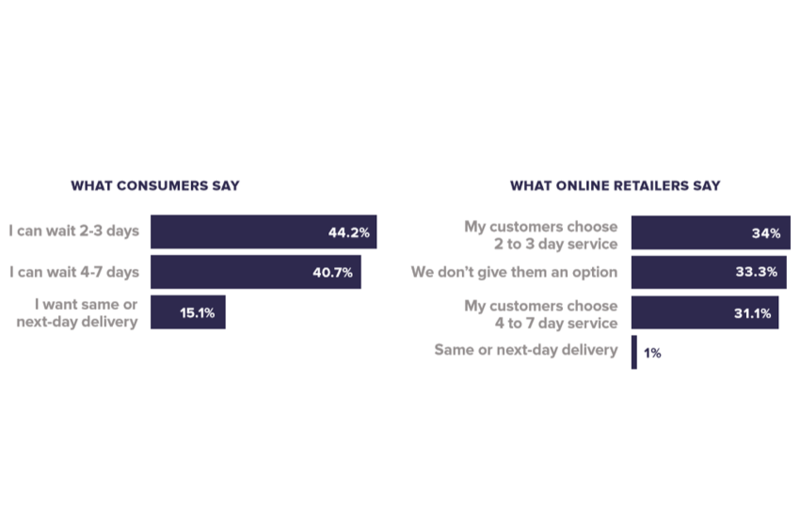 Regarding same-day deliveries, customers are more understanding as only 15.1% want the same or next day delivery. But almost half or 44.2% said they can wait for 2 to 3 days, while another 40.7% said they can wait 4 to 7 days. The key as in most things in life is having good communications between. Shippo reports having all of the information about package fulfillment on a company page goes a long way to improve the customer experience. Small retailers are catching on though albeit very slowly. The survey saw a 1 to 5 percent increase from 2017 for providing information on shipping costs, average fulfillment time, the carrier who will deliver the item, and when the item will ship. You can download the 2018 State of Shipping report (PDF) from Shippo here.